During the recent holidays I was amazed to learn that grandson John, in Kindergarten, had learned from his dad the basic chess moves. John challenged granddad to a game and by golly he knew how to count the Knight move as either 1 vertical, 2 horizontal or 2 vertical, 1 horizontal. He knew the Bishops move along the diagonals, and so on, for all the chess pieces! For many years Martin Gardner wrote the Mathematical Games column in the Scientific American magazine. He had a large following among professional and laymen alike. He stripped away the drudgery-coating on school mathematics and revealed the hidden kernel of logic, beauty, and utility. My life-long interest in mathematics was sparked by a problem, I deemed insoluble, in one of his columns. In 1969 he suggested a chess variant on a 5 x 5 board in which all chess moves, including pawn double-move, en-passant capture, as and castling can be made. Here’s the board’s setup. I’ve often recommended the smaller board to parents and teachers interested in teaching the basics of chess. The smaller board makes for quicker games and let’s kids master the basic moves before moving to the larger 64-square battlefield. 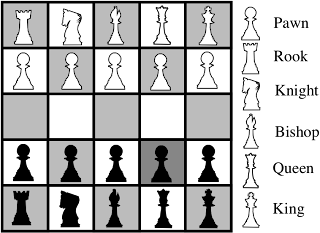 Also, the pawn double-move, en passant capture, and castling can be introduced when the transition to the larger board is made. If you are a chess player, share your knowledge with your kids and grand kids. Mask off a 5 x 5 section of a regular chess board or mark off a mini-chess board on a sheet of paper. Learning to play chess is one of those skills that anyone can take into adulthood and enjoy through life. I've been playing chess on my computer just to practice up for John's future challenges. I don't want grandadscience to be embarrassed.